My first wild cave trip was to a cave named Clarksville. Randy, the director of my college outdoor program, took me there alone as training for a later trip, which I was to be partly responsible for. We talked on the drive over about gear, safety, and what I would need to learn. In a rocky parking lot behind a small store, we put on helmets, gloves, kneepads, and dusty WWI army coveralls that Randy had gotten from a surplus store years before. Hiking somewhat stiffly along the trail to the entrance, I imagined beautiful hanging formations, a good deal of ambient light, and wide, easy passageways. Looking around expectantly for the way in, I saw nothing–the ground seemed rocky enough, but there didn’t seem to be any cliffs large enough to support the walk-in entrance I imagined. Randy, meanwhile, had stopped above a tiny hole in the ground between two rocks. “Don’t forget to turn on your light,” he said as he vanished into the ground like a gopher. The world became surreal as my expectations realigned with reality—somehow, until that moment, I had neglected to consider that caves might involve small spaces. Nonetheless, here I was, standing over a hole barely a foot and a half across, and, fortunately for me, too stubborn to back out. Swallowing my fear, I turned on my headlamp and lowered myself gingerly over slick, cool rocks into another world. One does not learn from the curated reality of a textbook, museum, or show cave that wild caves are incredibly alien places. The processes that create them begin on the surface, but quickly enter a realm of chemistry and confinement that is mostly invisible from the above. Groundwater, picking up acidity from the soil, seeps into bedrock and starts dribbling its way down toward the water table. As it goes, it dissolves the calcium that is a major component of carbonate rocks—usually limestone but sometimes marble or a few other types—and carries it away. The more these insipient spaces dissolve, the more water they can carry, and the more rock that water can dissolve. Above the water table, tributaries form along joints or beds in the rock that carry water downward. Below the water table, currents dissolve the rock wherever the water is moving. Caves are really the footprints of water, revealing what it did and where it went. Sometimes they show the path of water from recent storms, and other times they show the route of phantom streams that vanished millions of years before. Unlike streams on the surface, they follow patterns that are not immediately intuitive. Often the way forward for a human being will appear nearly random—a huge room may stop suddenly and the continuing passage may be a tiny hole in the wall on one side, or in the floor at the top of a mound of dirt and rock. At times, to go down, one must instead climb up, tracing abandoned passages to reconnect with the water’s main path. Such travel is never simple—rock is carved into fins, spires, and bizarre fingers, or collapsed in breakdown: huge slabs that have fallen from the ceiling under their own weight. The first room that Randy and I entered in Clarksville cave was a large breakdown room with at least six paths leading out of it. With my claustrophobia temporarily assuaged by the large room, Randy gave me my first lessons in cave navigation. “Look at where we just came from,” Randy instructed me, pointing at a small, inconspicuous hole near the top of a pile of rock. “Remember what it looks like.” The advice was well-timed; had I entered the room from another route, I would never have given that particular hole a second’s thought. In a complex cave, getting lost can be as much of a hazard as anything else—thus, memorizing your route can be crucial. As we continued on, I also discovered that one doesn’t really walk so much as clamber—over rocks, under rocks, and across ledges or mud banks. And then the tunnel opened into a wide, comfortably high stream passage. We sloshed forward through water and gravel, enjoying the echoes and the oppressive and exciting feeling of being deep in the bones of the earth. This was nature in its raw state; unrestrained, unmolded by human hands. Just being, for its own sake. The crux of the matter—I am a stubborn person, something I despise and for which I am eternally thankful. It requires a certain presence of mind to restrain it, but without it, I would never have been able to do one of the things I most enjoy. We went through the crack. I have traveled much more difficult passages since, but at the moment we emerged into the chamber beyond that crack, it was the most remote place in the world. I wriggled out the other side into a second room where I could rest, only to be presented with another tight passage leading onward. I came face to face with dread in a way I had never done before. My life, my friends, my comforts and aspirations and principals: all shrunken down to a bathroom-sized chamber in solid rock and the simple fact of having to go on. That is a place of true wilderness—when you are alone with the world, and you hit a limit, and you know that you are the one who will have to bend. It is difficult to describe why I do this. Caves here in the Northeastern United States are often small, narrow, or both. I am, or used to be, claustrophobic. Caves are wet; I am nervous in water. Most caving involves climbing, descending pits, or traversing far above the floor, and I have a healthy dislike of heights. 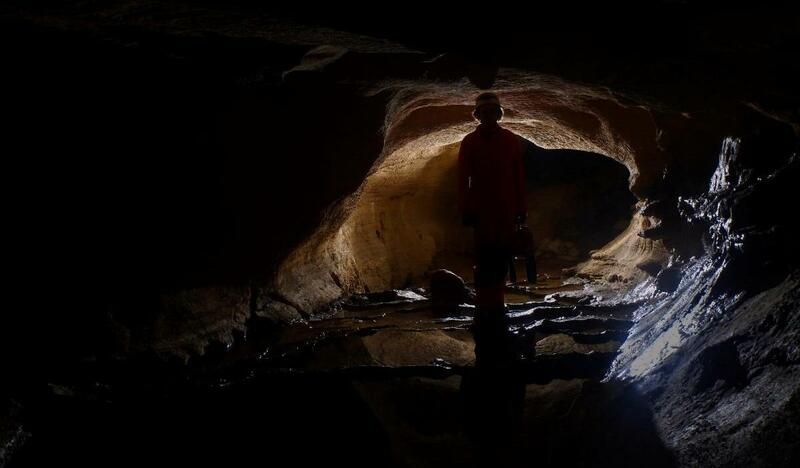 Caves are dark—and I do not mean the ambient darkness of nighttime, or the grey light of darkness in a movie; caves are truly dark. Without a light source, you cannot see at all; as a caver, I carry three, because I know that finding my way from the depths to the surface without them would be next to impossible. So, with my helmet, and lights, and gloves, and assorted other gear, I crawl and climb and push and squeeze my way into the dark until the cave decrees that one can go no further. It is often painful, exhausting, cold, difficult, and pervasively dirty. There is something unnamable here that I find in few other places. It is something of solace, something of serenity, something of freedom, something of spirit. All and none of these, and more. The surface world is tracked, mapped, explored, numbered, and daily disassembled by those who would profit at its expense. The surface is crowded, and growing more so daily. The surface is busy, and loud, and tiring, and we dream of fantasy and space travel and the romantic days of the past because they satiate our desire for the new, the different, and the unknown. I find my unknown in the bones of the earth, following the tracks of water and stone that wend their way beneath us and which few human beings ever see. And I find beauty in the sculpturing of nature, the carving and building of water and rock. Perhaps most importantly, I find places rarely touched or seen. There are caves almost everywhere beneath our feet, but they are unknown by all but a few and most of them are as wild and unaltered as any place on earth. Many of them begin and end in the depths, inaccessible to any human. Many more will only be visited by the few tenacious explorers skilled and hungry enough to do so. Caves contain some of the last true wilderness left on this planet.